1831 January 29. Robert Lebby Jr., the second son of Dr. Robert Lebby Sr. (1805-1882) and Elizabeth Rivers Lebby (1809-1882), was born in the Wappoo Section of James Island, St. Andrew’s Parish, South Carolina. 1850 December. At age twenty-one Lebby graduated with a B.A. degree from South Carolina College (later the University of South Carolina) in Columbia. 1853 March. Lebby graduated with an M.D. degree from Charleston Medical College. 1853 November 8. At age twenty-one Dr. Robert Lebby Jr. married Mary Eliza Bee (1835-1917), daughter of Robert Rivers Bee (1799-1865) and Mary Morrison Bee (1811-1864), in Charleston. 1853-1856 Dr. Lebby centered his practice in Charleston. 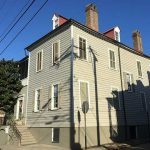 His family lived in the house at 62 South Battery until they sold it in 1872. 1854-1875 The couple had eight children: Joseph Hinson (1854-1937), Elizabeth Morrison (1856-1917), Mary (1857-1943), Julia Bee (1859-1944), Andrew Frederick (1862-1864), Robert Bee (1865-1927), Katherine Grattan (1870-1939), and Louis Walker (1875-1882). The first three children were ￼born in Charleston: the fourth on James Island; the fifth in Sumter, South Carolina; the sixth and seventh in Charleston; and the eighth at Oyster Point on James Island. 1856 Dr. Lebby moved the center of his practice to James Island, where he also maintained the Wappoo Hall plantation (probably his fathers), which was traversed by the road between the Wappoo Cut Bridge and the Stono River Bridge to Johns Island. 1861 April 12. Dr. Lebby was still practicing medicine on James Island with a college friend, Captain George S. James, who was in command of the Confederate forces at Fort Johnson. Dr. Lebby was present at the fort when the first shot of the Civil War was fired from Fort Johnson at Fort Sumter at 4:30 a.m. Lebby was thirty years old, and he and his wife had four young children. 1861-1865 Dr. Lebby served as Surgeon in the C.S. Army for most if not all of the Civil War. His family took refuge in Sumter, South Carolina. 1869 After the war he stayed for a while with his family in Sumter and may have resumed his practice on James Island, eventually moving it to Charleston. 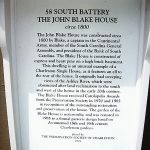 The Charleston City Directory of 1869 lists him at 40 South Bay (presently 62 South Battery). 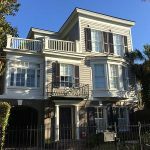 1872 Dr. Lebby sold the home at 40 South Bay and with the proceeds bought Oyster Point plantation, located near the center of James Island southeast of Wappoo Hall. 1873 May. The James Island Agricultural Society held its first formal meeting, and Dr. Robert Lebby Jr. was elected vice-president. The Society had been organized by a small group of James Island planters on July 4, 1872. By 1877 Dr. Lebby, William G. Hinson, and Elias Lynch Rivers were among the most successful cotton planters of the Sea Islands. The three were cousins and each had been an officer in the C.S. Army. They played prominent roles in the reorganization of the Agricultural Society of South Carolina. Rivers developed a wilt-resistant seed, and Hinson was a pioneer in sub-soil drainage of coastal lands. 1878-1882 Dr. Robert Lebby Jr. served as Assistant Health Officer of South Carolina. 1882 March 9. Dr. Lebby was appointed Quarantine Officer by governor Johnson Hagood. He held the position for the next twenty-four years, until his retirement. 1878-1887 For nine years, regardless of the weather, Dr. Lebby made the long buggy or horseback ride between his home at Oyster Point and his office at the Charleston Quarantine Station at Fort Johnson. 1887 The official residence for the Quarantine Office at Fort Johnson was finally completed, a project that had been initiated by his father, Dr. Robert Lebby Sr. Dr. Lebby Jr. moved there with his family. 1906 At age seventy-five Dr. Lebby retired as Quarantine Officer. He and his family returned to Oyster Point after an absence of almost twenty-years. 1907 October 11. At age seventy-six Dr. Robert Lebby Jr. died at Oyster Point. He had been a member of the South Carolina Medical Society and the South Carolina Medical Association. 1917 A few years after the death of her husband Dr. Lebby’s wife Mary Bee Lebby moved with her sister and two unmarried daughters to Mount Pleasant, South Carolina. It was there that she died on March 29, 1917. Robert and Mary Bee Lebby were buried in the Presbyterian Churchyard on James Island. When James’s Battery Opened the Ball: The First Shot of the War–Dr. Robert Lebby tells the story of the beginning of the bombardment of Ft. Sumter.